Damp but undaunted: some of the World Kitchen team. 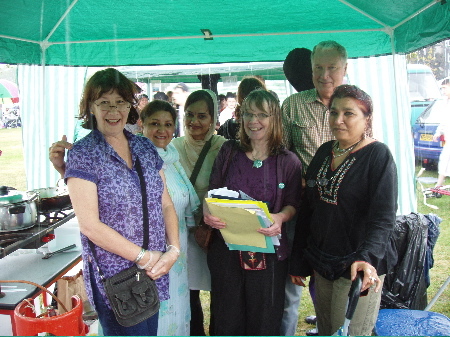 From the left Jo, Pip, Balvinder, Fay, Mridu and Gordon. Planet Asia (an oasis of exotic food in the industrial landscape of Norton Park, just off Easter Road) for contributing essential raw ingredients for main dishes of the day. Kleofas Cafe (a warm and welcoming Polish cafe in Gorgie Road) for generously donating delicious cakes made to traditional Polish recipes. 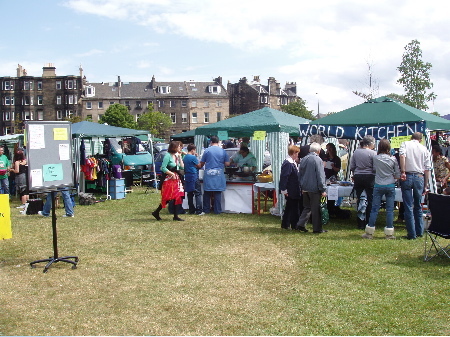 Stewart Blaik (chair of Leith Open Space Group as well as Leith Central Community Council) for printing leaflets and food stories explaining the aims of World Kitchen in Leith. 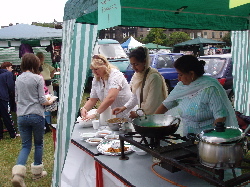 Bellevue Cash and Carry (in McDonald Place) for generous help with catering supplies and Rajah’s Supermarket (in Leith Walk) for spicy flavours and foods. 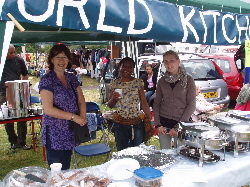 Mary Moriarty (Stalls Secretary of Leith Festival) for sympathetic support, advice and guidance right from the moment she heard about World Kitchen in Leith. The Scouts Association of Scotland (from their leafy Fordell Firs HQ in Fife) for the very efficient gas burners (seemingly made from girders!) which cooked hundreds, maybe thousands, of pakoras and heated a gallon of soup. Andrew Wilson at the Leith hire company for essential outdoor catering equipment. Celia and Sam Barron for a basket full of delicious Irish soda and wheaten bread (made to Granny Barron’s original recipe). Alice Musamba and Kapulu Simonde (of the Africa Centre) for sumptuous African food, including maize meal porridge and beans with coconut. Fran Wasoff for mouthwatering American chocolate chip cookies (and the polythene bags which kept them crisp despite the rain). Patricia Brand for the huge pot of warming West African chilli pepper soup which helped comfort crowds after the first rainstorm. Corinna (from Austria) a student on an intern placement at the Africa Centre, for hours of patient help and support. (Pictured below on the right with Agnes, centre, and Jo). Jo Simpson for a long day of good humour and help, tirelessly leafleting, serving food, clearing up and making cups of tea. And by no means least, Leith Academy for the kind loan of invaluable tables and chairs to put all this stuff on! Coming soon: food stories and recipes from the World Kitchen in Leith.